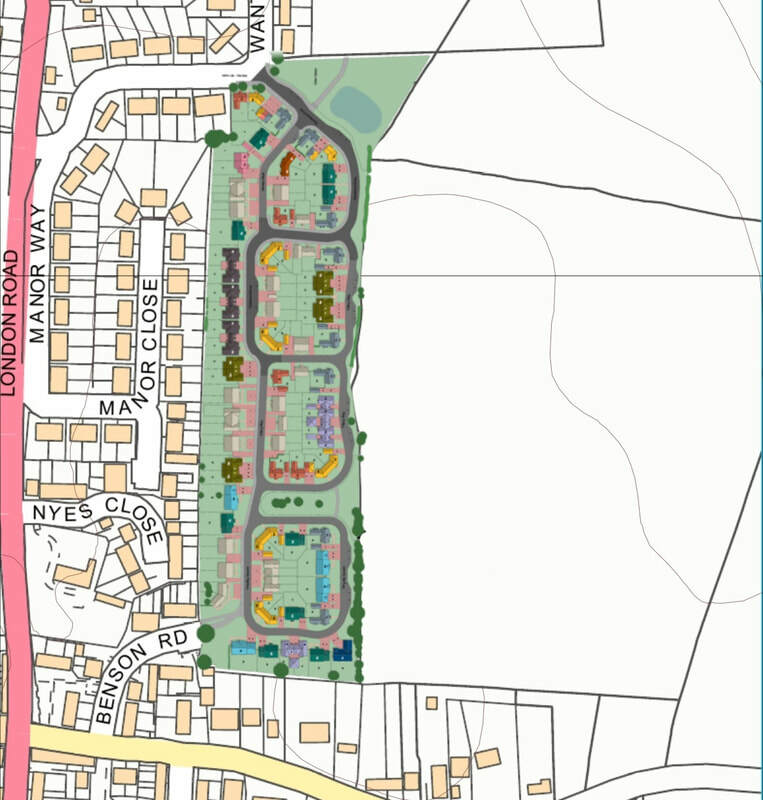 What has been referred to in years of planning applications as "land of east of Manor Close" is now being built on, and has become the "Meadow Walk" development. The land in question is a large north-strip running from east of Manor Close at its northern end to east of Benson Road at its southern end. The houses (102 in all) have been built by Croudace on land originally the property of the Coleman family, former owners of Wantley Manor. The map on the right shows how the new houses fit on to the existing development. The main road running through Meadow Walk is Charlwood Drive, and its starting point is at the junction with Manor Way. There is no vehicular access to Benson Road, only a footpath. Meadow Walk 1-2: Two photos from April 2016 showing the beginning of the construction at the Manor Close end - through which all motor traffic from the new estate will access the London Road. Access to Benson Road will be for pedestrians only. Meadow Walk construction from Furner's Lane: A long shot taken in early May 2016, showing the construction work at the new Meadow Walk across the fields. Meadow Walk development: A view of the south-east side of the Meadow Walk development from the end of Benson Road in early August 2017. The footpath dividing the development houses from the Benson Road/Nyes Close houses can be seen running down the left of the photograph, towards the built houses in the distance. Meadow Walk 1: The development was getting closer to its finished state when this photo was taken in mid-February 2018. The new estate can now be reached from the end of Benson Road.